Traditional Chinese and Japanese landscape design is gorgeously represented in these neighbouring gardens, which provide a tranquil retreat from the city and take hours to explore thoroughly. The grounds are huge and immaculately well-maintained and will delight gardening enthusiasts. The Imperial Sung Dynasty style is clipped to perfection within the 13-hectare (33-acre) Chinese Garden. It boasts the world's largest Suzhou-style Bonsai garden outside of China, containing more than 1,000 plants. 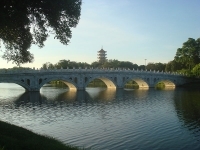 There is also a seven-storey pagoda which affords views of the city and a number of graceful bridges spanning the water. The symmetry and simplicity of Zen aesthetics is the motif of the Japanese Garden with its peaceful rock gardens and summerhouses. It is interesting to compare the landscaping traditions of the two cultures, and the difference is so striking that you are immediately aware when you move from one to the other. There is a wealth of bird life in the gardens and visitors will likely see animals like monitor lizards, squirrels and fish. There is also a Live Turtle and Tortoise Museum which is a great stop for those travelling with kids in Singapore. You can buy drinks in the gardens but no food is available so pack your own if you want to make a day of it.